You can add, edit, and delete announcements from the Announcements page. 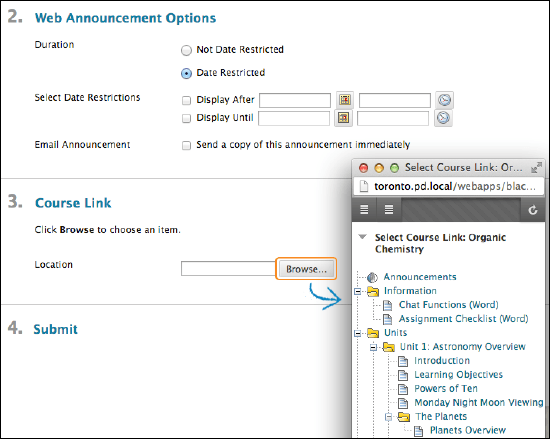 When you add an announcement, you can also send it as an email to students in your course. 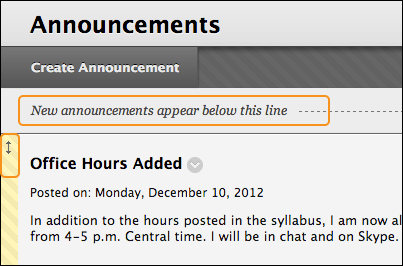 Students will receive the announcement even if they don’t log in to your course. On the Control Panel, go to Module Tools > Announcements or click on announcements in the left menu. If you choose Date Restricted, select the Display After and Display until check boxes to enable the date and time selections. Provide the date and time restriction settings immediately. Select the Email Announcement check box to send students an email containing the announcement. The email is sent to all students immediately. Links to course content won’t appear in the email announcement if you choose to send one. Students will see announcements in the order you choose. Students don’t see the bar and can’t reorder announcements. To edit or delete an announcement, select Edit or Delete in its menu. The delete action is final and irreversible, but it will not recall sent emails if emails were sent.